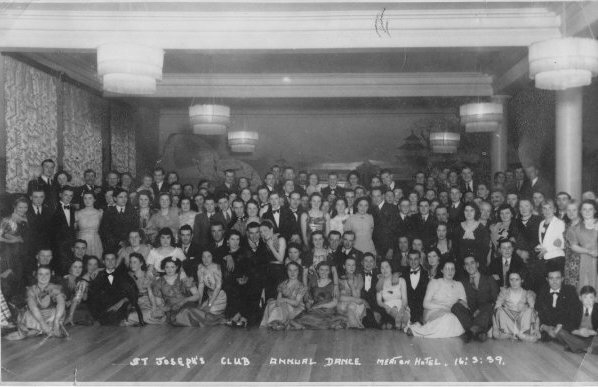 The annual dance was held at the Merton Hotel in Jersey, Channel Islands. The above photo was sent to me by an aunty. In it are my grandfather Rene Gosselin, aged about 24 (first on right in suit) and his future wife Edith Bouchere, aged about 17 (2nd from right with crossed legs). The photo is dated 16th March 1939. Life changed dramatically after this photo as the 2nd World War begun. This could have possibly been one of the last special occasions of fun, light-heartedness and a little bit of glamour for quite some time. Jersey was to be occupied by the German forces for 5 long hard years of very little luxury, so to have an image such as this is a joy and very precious. Maybe you know of a relative that was also at this occasion. Can you recognise them? What were their names? Could you share it with us? Any extra information is always gratefully recieved and enjoyed!